William Frej has been photographing indigenous people for over 40 years, while living in Indonesia, Poland, Kazakhstan, Afghanistan and Mexico, as well as other remote mountainous regions of Asia, documenting the changing lifestyles and architecture of many of the world’s unique cultures. In 2014, his one-person photographic exhibition Enduring Cultures was featured at Galeria La Eskalera in Merida, Mexico as part of a citywide arts festival. It included recent black and white and color photography from Afghanistan, Upper Mustang, Nepal, and San Augustin Etla, Oaxaca, Mexico. During 2015-2016, his photography was featured in the exhibition which opened June 2015 at the Museum of Spanish Colonial Arts in Santa Fe, New Mexico, entitled Tradicion, Devocion Y Vida: 80 years of Black and White Photography in New Mexico and Mexico. His photography of the Day of the Dead (Dia de los Muertos) in Oaxaca, Mexico was exhibited October-December 2015 in a one-person show at Peters Projects Gallery in Santa Fe, New Mexico. Black and white photographs were featured in a major exhibition entitled Chimayo: A Pilgrimage Through Two Centuries at the Museum of Spanish Colonial Art in Santa Fe, New Mexico in 2016. His work was featured in the exhibition The Maya at Peyton Wright Gallery also in 2016. His work was also featured in Mirror, Mirror: Photographs of Frida Kahlo in 2017 at the Museum of Spanish Colonial Art in Santa Fe. Mr. Frej’s photographs were also featured in one-person exhibitions, The Nomads of Kyrgyzstan, in Almaty, Kazakhstan in 2008 and Himalayan Pilgrimage, at the Museum of Asia and the Pacific in Warsaw, Poland in 1998. His photographic work, Taninbar to Tibet, was featured in a one-person show at the Duta Fine Arts Museum and Gallery in Jakarta, Indonesia in 1991. Mr. Frej’s other exhibitions include the Tucson Art Center in 1972, The Eye Gallery in San Francisco in 1977, and the San Francisco Arts Festival in 1976 and 1977. His photographs of Peru received purchase awards from the San Francisco Arts Commission and the San Francisco Arts Festival in the 1970s. 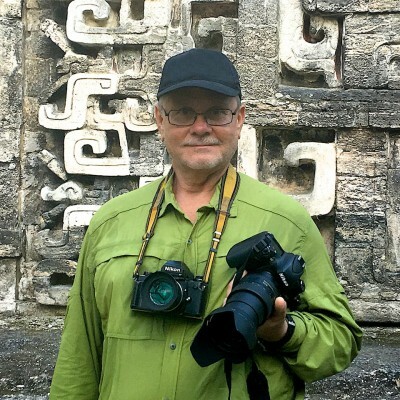 His photographs of the Himalaya, India and Africa were featured in the Edwin Bernbaum book, Sacred Mountains of the World, and his photographs of India’s Tilwara camel fair were highlighted in Adventure Travel Magazine. Mr. Frej’s photographic work is represented in numerous public and private collections throughout the United States, Mexico, Europe and Asia. William Frej William Frej has been photographing indigenous people for over 40 years, while living in Indonesia, Poland, Kazakhstan, Afghanistan and Mexico, as well as other remote mountainous regions of Asia, documenting the changing lifestyles and architecture of many of the world’s unique cultures. In 2014, his one-person photographic exhibition Enduring Cultures was featured at Galeria La Eskalera in Merida, Mexico as part of a citywide arts festival. It included recent black and white and color photography from Afghanistan, Upper Mustang, Nepal, and San Augustin Etla, Oaxaca, Mexico. During 2015-2016, his photography was featured in the exhibition which opened June 2015 at the Museum of Spanish Colonial Arts in Santa Fe, New Mexico, entitled Tradicion, Devocion Y Vida: 80 years of Black and White Photography in New Mexico and Mexico. His photography of the Day of the Dead (Dia de los Muertos) in Oaxaca, Mexico was exhibited October-December 2015 in a one-person show at Peters Projects Gallery in Santa Fe, New Mexico. Black and white photographs were featured in a major exhibition entitled Chimayo: A Pilgrimage Through Two Centuries at the Museum of Spanish Colonial Art in Santa Fe, New Mexico in 2016. His work was featured in the exhibition The Maya at Peyton Wright Gallery also in 2016. His work was also featured in Mirror, Mirror: Photographs of Frida Kahlo in 2017 at the Museum of Spanish Colonial Art in Santa Fe. 60" x 40" x 61"
30" x 45" x 31"
20" x 30" x 21.5"
45" x 30" x 46.5"